I recently discovered this meme hosted by Diane of Bibliophile By The Sea and I knew I had to start joining. The premise is to share the first paragraph or so from the book you are currently reading or thinking of reading soon. I'm particularly interested in this linky because one of my favourite things to do when book buying is picking up a book and reading just that, the first paragraph. Of course the cover and blurb come first to my attention, but if I'm intrigued enough by those I move on to the first page. That's why I'm interested in this meme, it's like shopping for books but without the leg work! I hope to discover some new to me bloggers, authors and books through participating. Audie Palmer had never learned how to swim. As a boy when he went fishing with his father on Lake Conroe he was told that being a strong swimmer was dangerous because it gave a person a false sense of security. Most folks drowned because they struck out for shore thinking they could save themselves, while those who survived were found clinging to the wreckage. Interesting thought. I'd likely keep reading. I like that it's a simple observation that we'll all have a opinion on. I am curious about the rest of the book and would read on. I made a good choice in reading on - enjoying so far! 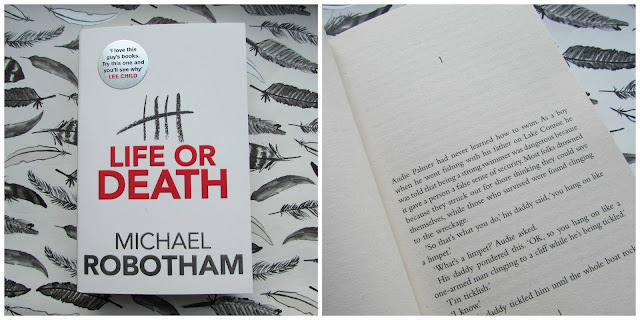 I love Michael Robotham's books. This is his new standalone that's set in Texas (can tell from the Lake Conroe reference). I have a copy and want to read it this year. It was interesting to think about this Australian author doing a book set in my state. I love his Joe O'Loughlin books. This is my first book by Michael Robotham and I'm really enjoying it so far - I'll be sure to check out more of his work. I enjoy Michael Robotham's books. I have read three now, I believe, and look forward to reading more by him. This one sounds really good! Thank you for sharing! This is my first, but I'd definitely read more! I like the sound of this one....now I'm very curious, as I'm not sure I agree with the narrator's father and want to know more. Thanks for sharing...and for visiting my blog. That's what I think makes this a good opening... It seems like a simple observation but the kind that makes you want to read more as your own opinion may differ. Oh...interesting. I got angry when I read the first part of this intro, but then it got me thinking once I finished. I'd keep reading. It's a simple opening, but an interesting observation. Thank you, Margot. I've really enjoyed my first participating post - everyone is so lovely here on this meme! Michael Robotham is an author who I must try this year as I've heard such good things about his writing - the opener certainly had me wanting to know more. Glad you're joining in this meme although it can be tough resisting all the brilliant books highlighted - but what a problem to have! This is my first experience with Michael Robotham's writing, but I see myself seeking out more of his work in the future. Haha! The book temptation is always there! I'd like this one I think. Thanks for joining us this week. Thank you, Diane - I'm really enjoying it so far. I'd give this one a try. It's proving to be a great read so far. I'm intrigued...and I love that you included a photo of the first page! Since this post I've finished reading Life or Death, and that opening paragraph has more significance that it first appears too.